Consumer Reports, normally a trusted source for parents everywhere looking for safe baby and child products, is currently feeling the backlash from their recent attack on attachment parenting practices. This week, on Earth Day no less, a post to the Consumer Reports safety blog entitled, “Five Products Not to Buy For Your Baby” admonished the use of both co-sleepers and baby slings. Slings and co-sleeping have long been considered beneficial baby tools by attachment parenting advocates, and the Consumer Reports post is garnering comments from angry parents by the minute. It’s likely no surprise to Inhabitots readers that the post at Consumer Reports is generating emotional responses. 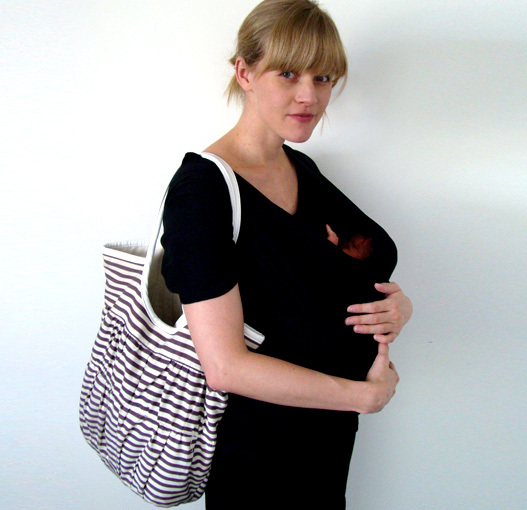 Inhabitots has posted many a positive post about both baby slings and co-sleeping, and while slings and co-sleeping are not in every parent’s repertoire, plenty of readers here are totally supportive of these choices. However, with the new warnings out from Consumer Reports, parents may be wondering just how safe are slings and co-sleepers? Consumer Reports notes, “Over the past five years, at least four babies died and there have been many reports of serious injury associated with the use of sling-type carriers. The incidents include skull fractures, head injuries, contusions and abrasions. Most occurred when the child fell out of the sling.” Consumer Reports instead recommends using another type of baby carrier. The problem here is that while the death of four babies is an absolute tragedy, it’s nowhere near substantial enough to support the banning of all slings. To put this into perspective, NPR reports that “Nearly a million children worldwide die every year as a result of unintentional injuries” the biggest killer being traffic accidents, followed by drowning, fires and burns, falls, and poisoning. So, while no one wants an accident, sling accidents are extremely uncommon compared to actual child accident risks. Consumer Reports says, “Although sleeping with a baby in an adult bed is a common practice among some cultures, it can be dangerous. The new bassinet-like devices designed to go in between parents or alongside an adult bed don’t necessarily make co-sleeping with a baby safer.” They recommend that babies ONLY sleep in a crib. Co-sleeping is not right for every family, but you’ll also notice that it’s not one of the major causes of child death (listed above). Co-sleeping advocates note that there are folks who should never co-sleep, for example, parents who drink or use drugs or smoke should not co-sleep. Young children should not be placed with babies to co-sleep either because small tots may be unaware of their baby siblings. That said, many parents (as many as 50% in recent studies) do admit to co-sleeping at some point, so if it was really as dangerous as Consumer Reports is saying, you’d think there would be more co-sleeping accidents reported. Furthermore, research by Dr. James J. McKenna at the University of Notre Dame notes that co-sleeping is actually safer than not co-sleeping and may even reduce SIDS risks. McKenna’s research is backed up by the fact that in most cultures around the world (minus the U.S.) families co-sleep more often than not, and guess which country has the highest SIDS rate? The United States of America. Lastly, Our Babies Ourselves by Meredith F. Small, points out that many studies relate the positives of co-sleeping. For example, there have been studies that measure a baby’s heart rate, muscle movements, breathing, and brain wave activity against a mamas, and the two match up perfectly, while babies who sleep alone will fuss and breathe sporadically more often. Learn more: Read the post at Consumer Reports; “Five products not to buy for your baby” along with all the reader comments. What do you think? Is Consumer Reports out of line, or do you think they’re offering valid safety concerns? Let us know in the comments. CR should stick to reviewing products, not parenting choices. I so miss those days when my baby could fit in a sling. They are so simple, you know when your child is in one, and you always hang on to them anyway. If anything I find the more technical carriers more problematic because they create a false sense of security. @Jenvandermeer and @Andrea - good points about the technical carriers sense of security and the usage issues. I had a Baby Bjourn and it was iffy if you didn't have it hooked up correctly. I felt safe with it, but I used it right, and even though it wasn't a sling, there was still a learning curve to using it. All baby products take care and time to use well. It's my opinion that slings and co-sleepers haven't proven statistically safe because there haven't been any huge, far-reaching studies done on them. It makes sense; since these parenting tools aren't as mainstream as cribs or car seats, it just hasn't happened...yet. Slings and co-sleepers aren't dangerous, if used correctly. It's not the product's fault that if someone is using it the wrong way!